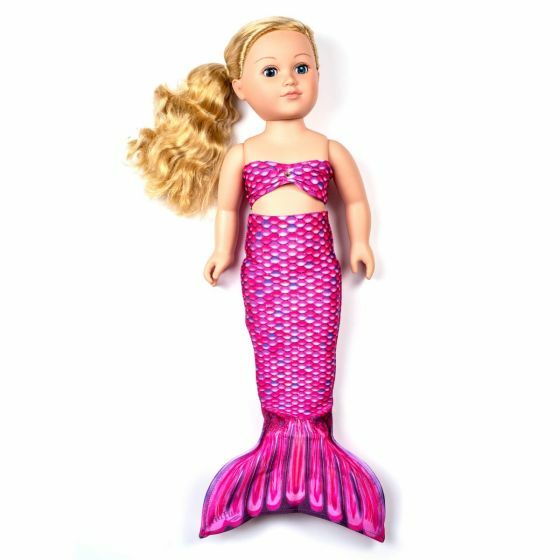 Now your child can match her favorite 18-inch doll when she’s dressed from tail to top in our Malibu Pink Mermaidens design! Made of the same swimsuit fabric as our full-sized tails. Doll not included. Kids can imagine life on the California beach when they have a matching mermaid tail set for themselves and their dolls in Malibu Pink! Fin Fun’s doll tail sets make the perfect gift for mermaid lovers, totally taking playtime to the next level! Our mermaid doll tails are made of the same swimsuit fabric as our full-sized collection for toddlers, kids and adults, so you know you’re getting the exact Mermaidens fabric that looks stunning both in photos and in person! This two-piece set includes a mermaid doll tail and bikini top with accent jewel for 18-inch dolls. Care Instructions: Hand wash doll tail and top. Hanging or lying flat to dry is recommended. Do not place in dryer or use in hot tubs. Materials & Construction: Durable swimsuit fabric – 82% polyester and 18% spandex.